In construction, it’s important to focus on the big picture. Even when you’re homing in on the smallest engineering element or finishing detail, every component is based upon — and will ultimately influence — the overall project. This is especially true during the design process. One of the main issues with blueprints (or even 2D designs) is that they fail to encapsulate the entirety of a project. In other words, with a flat mock-up you can’t always picture the structure in a true-to-life setting, which can make it difficult for clients to understand your vision. This can cause mix-ups and delays in decision making, and it can often result in costly changes down the road — all of which can affect the construction schedule and your bottom line. Improve understanding and efficiency. BIM creates a comprehensive 3D model of your project, allowing clients to experience what the space will actually look and feel like. This representation is prepared during the design phase, which makes it easier for all parties to have a better understanding of every level of the structure, design elements, landscapes, textures, and elevations. This helps identify problems or dislikes, and allows design options to be approved before construction begins. Develop an accurate timeline. By modeling your project as it moves from one design/build phase to the next, BIM software can assist you in creating a timeline for construction. The software looks at the resources needed and size of the project — data that can help the architect, project manager or builder generate an accurate construction timeline with deadlines and deliverables built in. This feature in invaluable, as it sets the stage for more strategic planning and budgeting before any final decisions are made. Obtain permits and approvals quickly. It’s not uncommon for home designs, buildings, and developments to be rejected for permits due to questions about how the finished project will actually look. With BIM, you can submit a realistic and accurate visualization with your permit application. This additional information will help answer questions about your project and minimize uncertainties — both major contributors to help win approvals more easily. Realize significant cost savings. Change orders will get more expensive as your project progresses, so being able to see everything well in advance of implementation can save you a lot of money. Another major benefit is improved operational efficiency — because designers, architects, and engineers have a realistic rendering of the project, which enables prompt and cost-efficient construction. 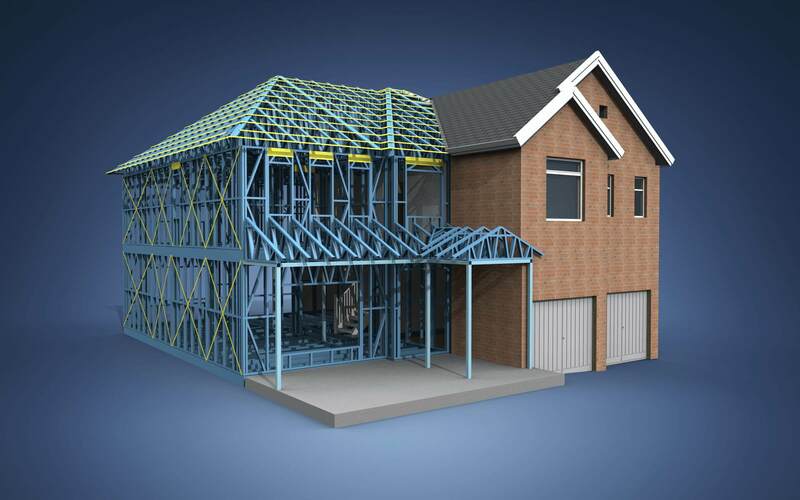 Another important benefit of 3D modeling is safety for your team and construction crew. The added dimension provided by BIM technology will improve pre-fabrication and pre-assembly methods, meaning safety can be factored in from the start. New features may be added to construction sites to eliminate hazards for workers, such as larger areas to walk, rails to hold on to, and zones specifically designated to keep clear of tools or debris. By providing an accurate 3D model, BIM software increases communication between everyone working on the project. That transparency helps your team accurately complete the structure with smart spending, efficiency, and safety in mind. Vertex BD is a flexible building design software that automates the creation of architectural drawing sets, panel fabrication drawings, material reports, renderings and manufacturing data, all from one building model. Learn more at www.vertexcad.com/bd.